So, here is the story. 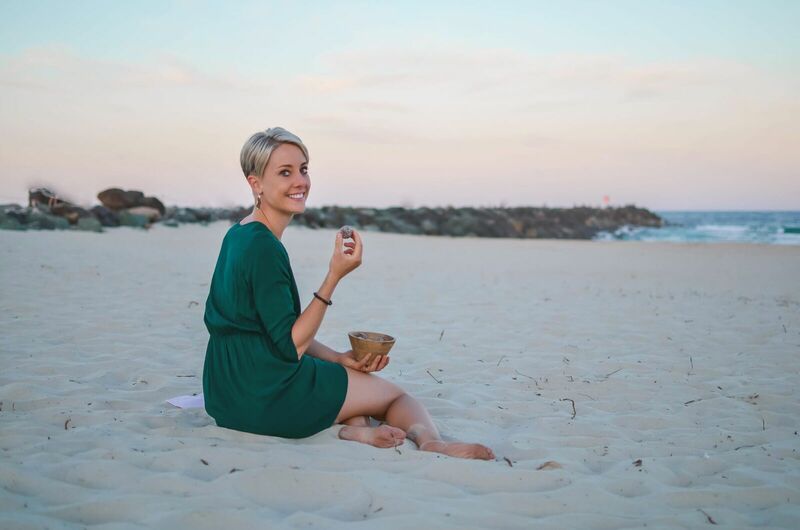 I came up with this recipe few days before I stared the Whole30, but didn’t have enough time to post it here. That’s when I was still happily living in the world where I had fair amount of dairy products in my daily diet. Without knowing that this is going to change quite soon. Not that I wasn’t aware of my light sensitivity to dairy before. But I simply came up with excuses why I should have it (probiotics and protein, you know?). And then I did the Whole30. And I could’t ignore the sensitivity anymore. That program really has some impact on my thinking about food, I have to admit. But despite the fact that I can’t personally have too much of these things anymore, I still decided to share this recipe with you. Because it’s too good to be buried at the bottom of a drawer. 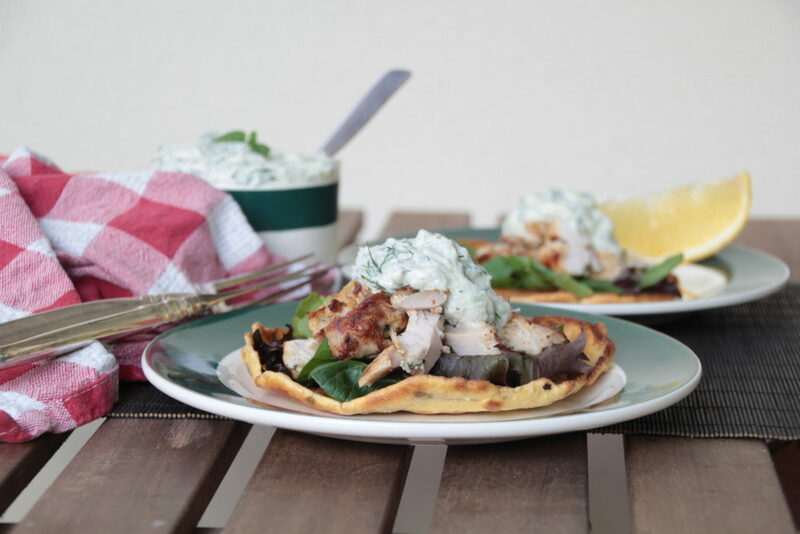 Healthy primal version of a Greek special - Chicken Gyros With Tzatziki (Paleo, Primal, Low Carb) served on gluten-free Coconut Flour Savory Pancakes. Chop all the herbs roughly (not too fine) and place them in a bowl. Add the yoghurt, olive oil, lemon juice, garlic, salt and pepper and mix everything together. Place the chicken thighs in a food container and pour the yoghurt marinade over the meat. Use your hands to cover all the chicken pieces in the yoghurt evenly. After that seal the container with a lid or a fresh foil and place it to the fridge for at least 2 hours. The best is over night, the yoghurt makes the chicken nicely tender. In the meanwhile you can prep the Tzatziki as well as Coconut Flour Savory Pancakes (click for recipe here). For the Tzatziki, grate the cucumber finely and place it in a bowl with all the other ingredients and mix them together. If you like the tzatziki thick, I recommend seeding the cucumber out at first. If you don't like waste as me, you can use the seeds in a smoothie or a vegetable salad for example. To finish the meat you can either grill it in a steak pan or on the BBQ. If you are using a pan, place it over a high heat and pour a tbsp of oil in. Once the pan is heated, grill the chicken for few minutes from both sides, until browned and crispy. To make sure that your chicken is cooked through, you can cut one of the pieces in the middle and see if it's nice and juicy inside. If your meat is still a bit pink in the middle, but it would go too dark on the outside when grilling more, place it on a baking tray and put it in the oven on 160 °C for 5-10 minutes. 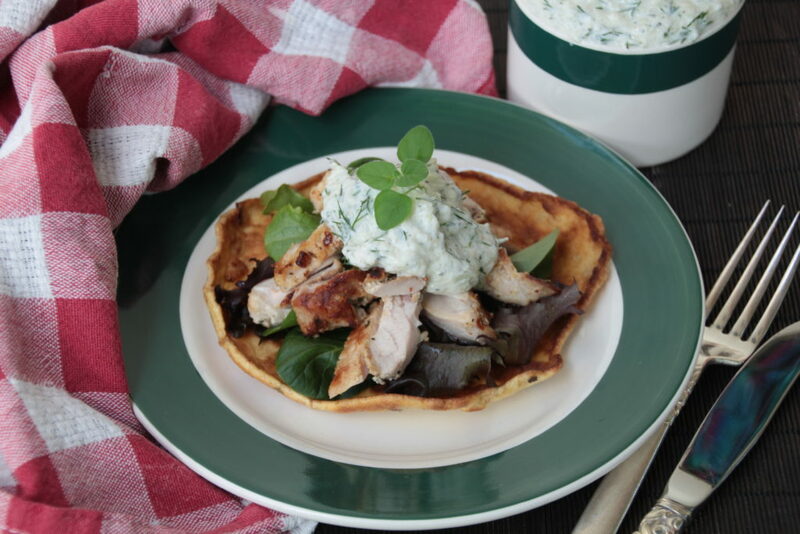 Once the chicken is ready, slice it in about 0,5 cm strips and top on the flat bread together with some green leaves, (maybe a bit of tomato and onion as well to stay even more authentic) and dollop of your homemade Tzatziki.